Helping inmates learn job skills and leading social justice projects in Latin America are just two of the reasons the John Brown University chapter of Students in Free Enterprise (SIFE) were named “Regional Champions” at the annual SIFE Regional Competition held on March 26 in Rogers, Ark. 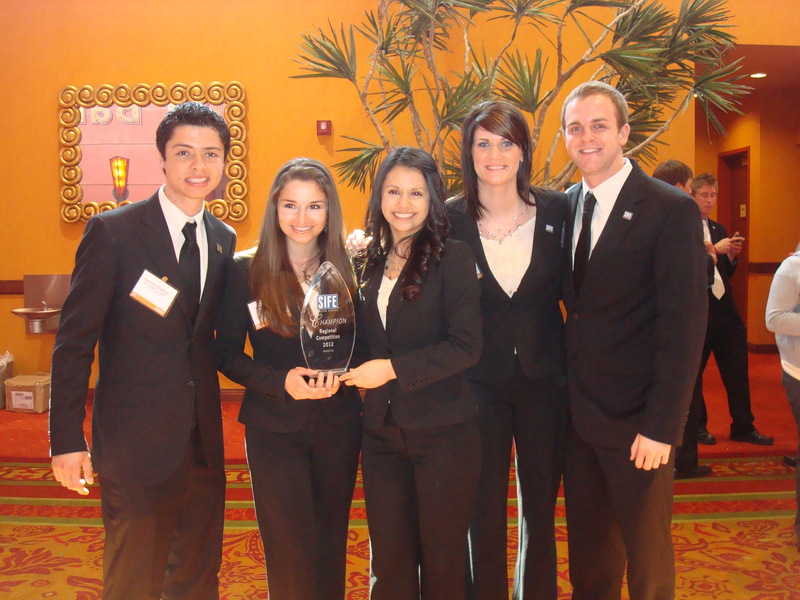 JBU was represented by students Marcel Guadron, Katherine Jaramillo, Estefania Verdin, Kassie Keeter and Phil Ruppert. Student teams presented projects conducted over the previous year and the impact that it had both locally and internationally. This year, a total of 15 colleges and universities from Arkansas, Kansas, Missouri and Oklahoma were represented at the regional competition. The JBU team will travel and compete at the 2012 SIFE USA National Exposition in Kansas City, Missouri, May 22-24. JBU has been a leading member of SIFE since 1977. Last year, the JBU team placed among the top 16 in the United States. This year, the John Brown University SIFE chapter committed time and resources to five international efforts and seven projects in the Northwest Arkansas community, including hosting job training for inmates at the Washington County Jail, teaching basic life skills at the Juvenile Detention Center, advancing educational business related concepts with students at local and international schools, promoting social wellbeing in a number of Central American countries and leading the Small Business Summit, which provides four monthly workshops for local entrepreneurs. SIFE is an international organization that mobilizes university students around the world to make a difference in their communities while developing the skills to become socially responsible business leaders. SIFE has active clubs on more than 1500 college and university campuses and over 48,000 students (representing a total of 39 countries) are involved in those clubs.